When I heard that No Doubt was releasing Tragic Kingdom for Rock Band last Tuesday, I immediately downloaded the entire album and then waited for my boyfriend to leave the house, so that I could scream along accordingly. 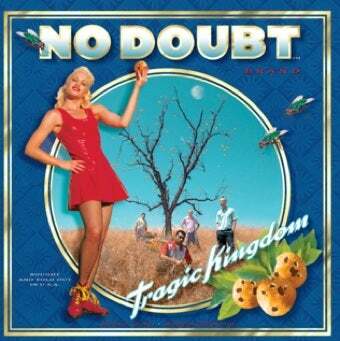 I was 15 years old when Tragic Kingdom dropped, and though I liked the album (and worshipped Gwen Stefani), it wasn't until I was 16, and I'd been dumped by my very first boyfriend, that the album became a staple in my CD player. It is the quintessential break-up album, after all, written by Gwen Stefani after her relationship to bandmate Tony Kanal, whom she assumed she'd grow up and marry someday, suddenly fell apart. The other CD that took up prime stereo real estate was Liz Phair's Exile in Guyville, a seminal album for many, but though I felt a connection with Phair, most of her songs were over my head and experience level and I knew it, and I viewed her more as a heroine for a life I had not yet lived, while Gwen Stefani, on the other hand, whose entire album was about the loss of her first big love, was singing songs that directly hit me in the heart. The entire album is essentially a step-by-step guide to How It Feels To Be 16 And Dumped, right down to the title, which is a play on the band's Anaheim roots, but can also be construed as a nod to the fact that a bit of the fantasy and magic that surrounds love is destroyed as soon as that first heartbreak comes, leaving you in a Tragic Kingdom, indeed. The album is filled with contradictions: Stefani sings about wanting to be on her own, sings about wanting to be married, sings about being over it, sings about being deep in it, and in doing so creates a narrative that is as honest as it is confused: mostly, you get the sense that she is heartbroken, and still coming to terms with the idea that her future is not what she envisioned it to be, and that finding the path out of the haze is going to be a difficult but ultimately worthwhile one. I was completely fine until I got to the section where Gwen starts to sing "I open up/you ignore me/oh you're not the same at all/nuh uh." And then, to my surprise, I totally lost it and started bawling with the microphone in my hand. I wasn't thinking of my dumb high school boyfriend: I was crying because I remembered myself as a 16-year-old girl, and how much that heartbreak hurt, how that first time you lose someone you love cements itself into a tiny corner of your heart and never lets you view things the same way again, and how it can be both a blessing and a curse. 15 years after that breakup, I don't really remember the boyfriend much at all, but I remember the sadness I felt, and how I thought for a while that that kind of sadness would never go away. But of course, it had. And standing in my living room at 29-years-old with a video game controller in my hand singing the soundtrack to that period, I realized that I, too, had come out on the other side, victorious, just as Gwen had made it seem like I would. And then, of course, I finished the song, just like I always used to, with tears in my eyes, my feet continually bouncing off of the floor, and my heart getting stronger by the minute.